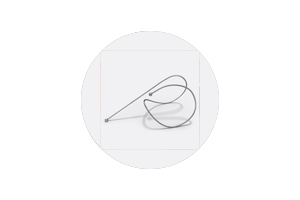 The PneumRx Coils are minimally invasive medical implants designed for the treatment of severe emphysema with hyperinflation. 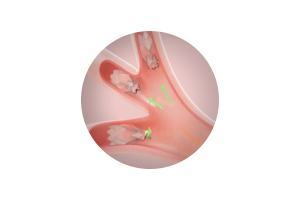 The Chartis system is a pulmonary diagnostic tool that allows doctors to identify which patients are appropriate for the Zephyr valve procedure. The Zephyr valve is a one-way valve that blocks airflow to the diseased region of the lung to allow healthy regions to expand and function more efficiently. Thanks to its excellent articulation properties and the narrowest exterior diameter of just 6.7 mm, this bronchoscope is easier to use than any other model before it. The large 120° field of view and 10° oblique view in the forwards direction provide optimal orientation. The Fujifilm high-resolution Super-CCD chip is synonymous with leading endoscopic image quality. 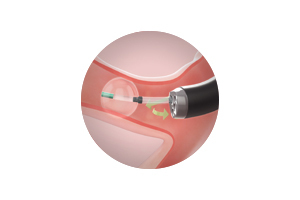 The convex ultrasound probe delivers reliable ultrasound images, while the optimised needle guide of the EB-530US facilitates safer TBNA procedures and precise puncture action.